Have you ever tried using story sticks with your class? My classes loved this little exercise and it can be used so many ways! We would get all the fiction books from our class library and the children would work their way through as many as they could. This exercise then works equally well for those who cotton on quickly and for those who need assistance. The children each take a book from the pile and four coloured sticks; one each of red, yellow, blue and green. For each story we wrote the main character on the yellow stick, the setting on the green stick, and the conflict on the red stick. For the blue stick, the children could choose any other item that appeared in the story. We kept the sticks in their story packs (unlabelled plastic bags) to start with. 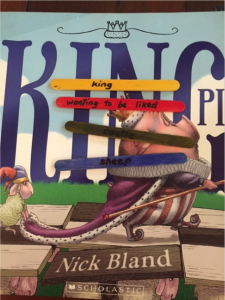 During the week, at shared book time, each child would select a bag, lay the sticks out in front of them and as the story was read they would silently identify (place hands on head, sit on hands etc) if they had the stick set related to that book. As they became familiar with the classification we then came up with our own ideas for characters, settings, conflicts, and “special items” that could appear in stories. 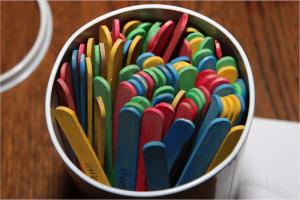 The sticks then got put into a tin for the children to select from for oral story telling sessions (group and individual) and written language. PS: If you would like a unit with over 40 fun activities based on the fabulous King Pig book you will find one here.